Each year, around three million people from the United States and around the world visit Mount Rushmore. The famous, mountainside memorial features colossal statues of United States Presidents George Washington, Thomas Jefferson, Theodore Roosevelt and Abraham Lincoln carved into granite. Found in the beautiful Black Hills of South Dakota, Mount Rushmore represents the successes of the American presidency in early U.S. history and has become a national symbol for the country. Mount Rushmore is named for a New York City lawyer, Charles E. Rushmore, who came to view the property's legal titles in 1884. Impressed by the mountains, he asked a man named Bill Challis (a local resident and guide) about its name. He responded, "Never had a name but from now on we'll call it Rushmore." 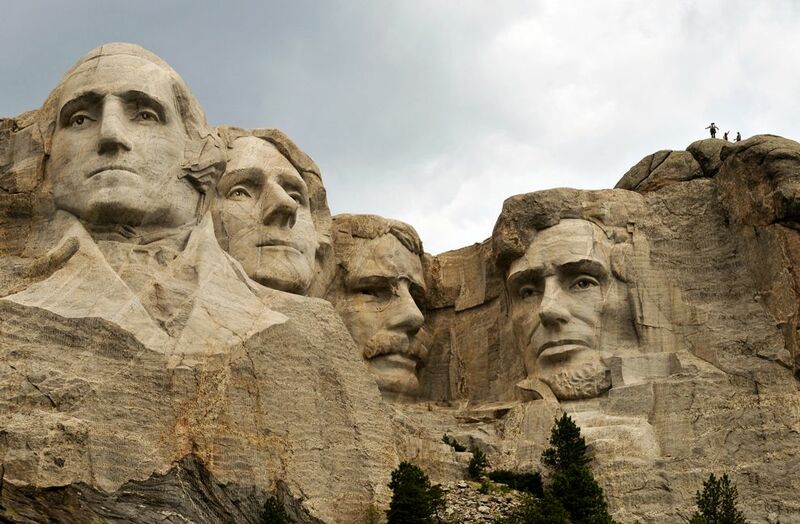 In 1924, sculptor Gutzon Borglum was brought to South Dakota by historian Doane Robinson (known as the "Father of Mount Rushmore") to oversee the project of carving the presidents' faces into the hillside. Between October 4, 1927 and October 31, 1941, Borglum and over 400 workers constructed the 60-foot (18 meter) high statue. Through dynamite blasts, about 450,000 tons of rock were blown from the mountain. The four presidents depicted in Mount Rushmore were chosen due to their accomplishments in the first 130 years of American history. Today, the U.S. National Park Service oversees the maintenance and conservation of Mount Rushmore. It's worth a visit! So, why were these four presidents chosen? George Washington, the 1st President of the United States: Washington led the Continental Army to victory in the American Revolutionary War (1775-1783), which granted independence from Great Britain. He also helped lay the foundation for the democratic U.S. government as it's known today. Thomas Jefferson, the 3rd President of the United States: Jefferson wrote the U.S. Declaration of Independence (1776) and helped to double the size of the U.S. in 1803 during his presidency. Theodore Roosevelt, the 26th President of the United States: Roosevelt is known for preserving workers' rights and leading the country through the turn of the 20th century, which saw the construction of the Panama Canal and immense economic growth. Abraham Lincoln, the 16th President of the United States: Lincoln's leadership preserved the Union during the difficult time of the Civil War (1861-1865) and is credited with abolishing slavery in the U.S.